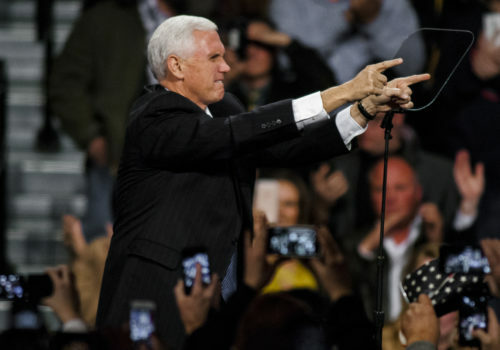 A group of trans activists was forced to leave a rally Mike Pence was speaking at and were told by someone wearing a “Gays for Trump” T-shirt that he’d “love to” erase them. Last Thursday, four transgender activists went to a rally held to support U.S. Representative Buddy Carter (R-GA) in Savannah, Georgia, where Pence was going to speak. Almost immediately, they were asked to leave because Carter recognized them from a campaign barbecue event they went to on Tuesday. At the Tuesday rally, the trans activists had held up signs that said “Hell is a place on Earth.” Carter wants to ban transgender people from the military and has a history of supporting anti-LGBTQ legislation. “Good to see y’all again. Enjoyed having y’all the other night. Did you enjoy the barbecue?” Carter asked at the Thursday rally. “What do you think about trans people?” asked Rainé Eliza, who posted video of the encounter on Facebook. Carter walked away, saying he had no comment. Minutes later, a state trooper asked the activists to leave, telling them that they’ll be arrested for trespassing if they didn’t. As they were leaving, they chanted “You cannot erase trans people.” They got some boos from the rally-goers, but mostly they left without interference from the crowd. As they were leaving, an unidentified man in a “Gays for Trump” T-shirt told them: “I’d love to, though,” referring to erasing trans people. He did not explain what he meant. Last night my friends and I went to the Pence/Kemp rally. We registered for the event but upon entering, we were asked for IDs even though it wasn't printed anywhere on the ticket that we would need them to enter. Thankfully some younger folks who were working the "not registered" table let us in. We then entered the ballroom and immediately were recognized by Congressman Buddy Carter from a previous engagement. He then alerted a staff member that we should not be present. We were not making any noise or disturbing anyone outside of just existing as we are. Upon our interaction with Congressman Carter, we then entered the crowd. A short while later, we were forcibly removed by the police who told us that we were being removed because the event holders did not want us there. As we exited we chanted "you cannot erase trans people" and "stop killing trans people." The audience booed and someone said to me "I wish I could." We exited the area where the event was but were told by security we could not be in the building.The bigoted people at this event who called us names and told us they would pray for us and told us to go back to Cuba and that people like us were better off dead are going to elect Kemp into office if we don't do whatever we can in the next couple of days to get people to the ballots. I'm not a believer in the two party system but what I do know is that we have a chance to put a dedicated person in office who resonates with the struggles of the people in our communities who need the most support right now. As for Congressman Carter, if he wants to represent the Georgians in his district, he needs to hear the struggles of the people in the community. I'm not surprised by his actions and the actions of the Kemp-Pence staff as a whole but it's incredibly depressing. It's obvious they don't want to acknowledge people like me even exist.